A while back I dusted off a book about Captain Cook at a market second hand book store and added it to my Australian history collection. 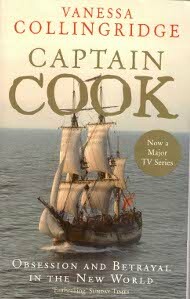 Captain Cook: Obsession and Betrayal in the New World by Vanessa Collingridge is as the title indicates about Australia’s founder and perhaps most revered explorer James Cook, but it mixes in a good amount of history of the early (1500-1770) European discovery – and philosophy – of Australia as it was known back then (Java la Grande, Terra Australis Incognita, etc). The book chronicles the life and times of two quite distinct figures – the eighteenth century mariner Captain James Cook and nineteenth century British adventurer, historian and polyglot (and distant relation to Vanessa) George Collingridge. It was at this point I thought I was going to hate this because the book begins by juxtaposing these two seemingly incompatible people, person by person, chapter by chapter. I am glad I persevered, however, as there a very interesting passages of Australia’s history intertwined in both stories. Cook would cement himself in history as the discoverer of the then unknown great southern land and Collingridge would postulate the earliest European discovery of Australia belonged to the Portuguese some centuries earlier. The scandal at the time was the very suggestion that the discovery of Australia had not belonged to Cook who was enshrined into the national psyche as the father of the continent. Collingridge’s work would go on to inspire debate on the pre-Cook discovery of Australia and in particular that of the Portuguese. This school of thought culminates in the recent work Beyond Capricorn by Peter Trickett. [See my review of that book here exactly one year ago. I definitely need to write more book reviews]. While the two ends don’t officially ‘meet’ the history of both adventures makes the book very interesting reading. Full credit to Collingridge (Vanessa) for writing about both in the same volume. As I’ve blogged about in the past, pre-Cook European discovery of Australia is a fascinating topic that deserves more recognition within the context of the events that led to the eventual British colonisation of the southern land. For example, this book tells the story of Spanish explorers led by de Queiros who first called aboriginal people “Australians” in what was perhaps the first ever use of the word “Australian”. The word Australia was first coined in Spanish. And in Cook’s travels he branded one James Mario Matra as “one of those men who could be spared”. That man who could be spared went on to recommend to the British government that Botany Bay (also named Stingray Bay) would make an ideal location for a penal colony. The Sydney suburb of Matraville is named in his honor. Regarding the puzzling Portuguese discovery George Collingridge was convinced it was possible, but like those after him, was forced to rely on the Dieppe Maps and other historical documents and remained taunted by a lack of coroborating hard evidence as to whether it actually did happen to a level of more than sightings of the Kimberley coast and the occasional landfall. Cook, having sailed through the South Pacific, Tahiti and as far north as Alaska met his end when he was clubbed to death by the aborigines of the Sandwich Islands (Hawaii). Captain Cook collates a number of key themes in Australian history and once you get used to the oscillatory nature of the parallel histories of the two main protagonists makes for very interesting reading on the age of discovery in the Southern Hemisphere.